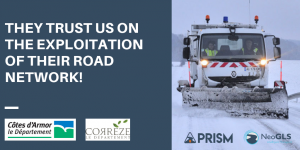 The departments of Côtes-d’Armor and Corrèze are equipped from now with our product PRISM to exploit all the missions related to the exploitation of their road network. This device allows them to simplify their actions and to save time, to record and of geolocate by GPS, via a precise mapping, events occurring on this latter area on a embarked tablet in the patrol vehicle. All the registered data and the declared events are also available via a central platform on the technical center to be able to visualize it and to program repair works. Our product PRISM: a personalized tool adapted to your respective needs and to your working approach.